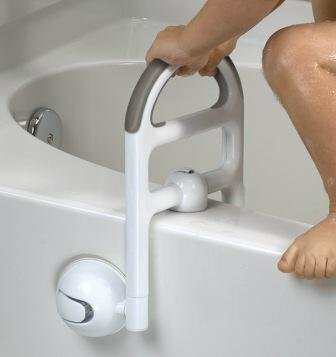 S371 Features: -Tall, ergonomic design with non-slip grip helps child get in and out of tub safely. -Adjusts to fit most standard tubs. -Three mounting points for extra stability. -Can mount to back of tub for standing stability. Product Type: -Bath Protectors/Guard. YAOHAOHAO The stainless steel bath rooms master bathroom armrest slip-resistant barrier-free bathroom hand rails hand rails older people glass handle shower shower safety bars (Size: 40 cm).